Vitally's native Intercom integration allows you to automatically track conversations you have with customers in Intercom back into Vitally. 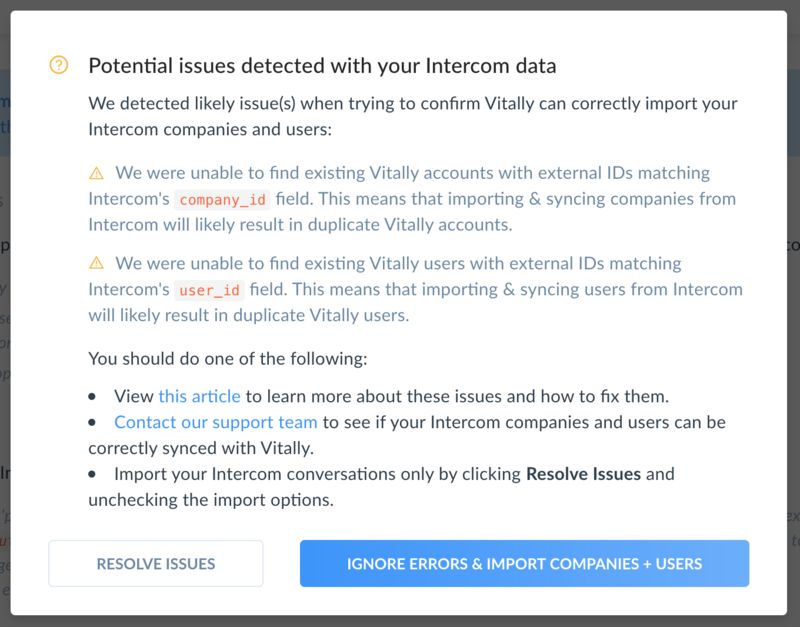 Optionally, you can also import your Intercom companies, users, and product events into Vitally and push Vitally's account data back to Intercom as custom_attributes on your Intercom companies. Let's see how that works! To enable the Intercom integration, navigate to the Conversations integrations section in your account's settings and click Configure next to Intercom. Confirm the company_id on your Intercom companies is the same unique ID tracked in your other customer data. For example, if you use Segment, ensure the ID you specify for customers in Segment is the exact same value as the company_id for your Intercom companies. We use this ID to combine your customer data under the same account in Vitally, so if you use different values here, we will create duplicate Vitally accounts (one from Segment and one from Intercom). Confirm the user_id on your Intercom users is the same unique ID tracked in your other user data. The same requirement for customer_id above also applies to Intercom users. If your Intercom user IDs differ from your other tools, we will create duplicate Vitally users (one from Intercom and one from your other tool). Note that if you aren't sure about the above, or if your Intercom IDs differ from your other tools, you can leave these options unchecked, and we'll import your conversations using user emails (i.e. if "user@company.com" starts a conversation in Intercom, we'll look for a user with that email in Vitally and attach the message to that user if found). We strongly encourage you resolve all issues prior to importing your Intercom companies and users. Because it is quite common to have companies in Intercom that don't actually have current subscriptions with your product, we only import companies into Vitally that have been seen over the last 90 days in Intercom. This option is only supported if you enable Option #1 above. If selected, we will auto-track your Intercom product events into Vitally. From there, you'll be able to leverage our default product metrics and create Elements, Success Metrics, and more, all backed by your existing Intercom events! This option is only supported if you enable Option #1 above. If selected, we will update your Intercom companies with data we track about your accounts in Vitally, giving you the ability to leverage our data for Intercom auto-messages and campaigns. Please see this article for more information on how this process works. (If configured) We'll import customers and users seen over the last 90 days. Note that this may take awhile to complete, as we import your Intercom data in a background task. We'll import your past customer conversations. Note that this may take awhile to complete, as we import your Intercom data in a background task. (If configured) We'll listen for new Intercom companies/users moving forward and will create or update accounts/users in Vitally. Vitally uses Intercom webhooks to listen for new Intercom companies and users. Once we receive a notification from Intercom, we'll look for an account/user in Vitally with an external ID matching Intercom's company_id/user_id. If found, we'll update the account/user in Vitally with Intercom's data. If not found, we'll create the account/user in Vitally. (If configured) We'll listen for and log all new product events sent from Intercom in Vitally. Vitally uses Intercom webhooks to listen for new Intercom product events. Once we receive a notification from Intercom , we'll create the product event in Vitally associated to the user that initiated it. We'll listen for new customer conversations moving forward. Vitally uses Intercom webhooks to listen for new Intercom conversations, so we should be able to create your Intercom conversations in Vitally in near real-time. When importing your Intercom companies, we flatten the API version of the company returned from Intercom (see Intercom's docs) and add every property as a trait to the Vitally account, prefixed with "Intercom". For example, you'll have traits in Vitally named Intercom company_id, Intercom session_count, etc that are mapped to the company_id, session_count, etc properties returned by Intercom. Additionally, all your custom_attributes from Intercom will be imported and added as traits named Intercom custom attributes [attribute_name] in Vitally. We follow the same process for users as we do for companies - i.e. we flatten the API version of the users returned from Intercom (see Intercom's docs) and add every property as a trait to the Vitally user, prefixed with "Intercom". For each conversation you have with customers in Intercom, we'll add the conversation to Vitally, importing the conversation's subject (if present), message, and participants. For each product event tracked via Intercom's API, we'll create that event in Vitally and associate it to the right user. If you'd like to disable the Intercom integration and revoke Vitally's access to your Intercom account, you can do so from the Intercom configuration page in your account's settings (there's a Disable Intercom link in the bottom left). When disabling Intercom, you can also optionally delete all data imported from Intercom. Note that this is permanent and irreversible, and applies to any companies, users, and conversations imported from Intercom! You should usually only do this if you are only disabling the integration to re-enable it after fixing issues with the initial import.